The Makarov Pistol entered service as the primary service pistol in the armed forces and security services of the Soviet Union in 1951. It continues to serve in the forces of the Russian Federation, and the former Soviet Union, and of nations around the world. It has been estimated that some 5 million Makarov pistols had been produced in the Soviet Union and Russian Federation alone up 2002, and production continues for military, police and civil markets in Russia to this day. Additionally, the Makarov Pistol was also produced under license in East Germany, Bulgaria and China. The Makarov Pistol has served around the world in conflicts and security duties in all climates and terrains, and can claim the distinction of being the first firearm to be carried into space. Despite the large numbers and the widespread use of the Makarov Pistol, it remained a rare and little known firearm among western collectors until the end of the Cold War. In the 1990s however, large numbers of Makarov Pistols, accessories and its previously unobtainable 9x18mm cartridge were exported to the west with the end of the Cold War and the collapse of the Eastern Bloc, opening up a new field of firearms collecting. While collectors have been documenting and recording the many aspects of the Makarov Pistol over the last 25 years, this information has never been systematically consolidated into a handy reference book - until now. 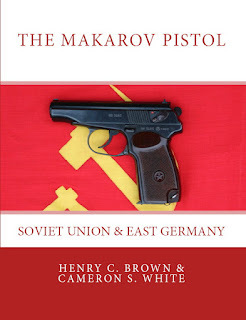 This book documents the Makarov Pistols produced by the Soviet Union and Russian Federation, and the Pistole M, the version produced in East Germany. 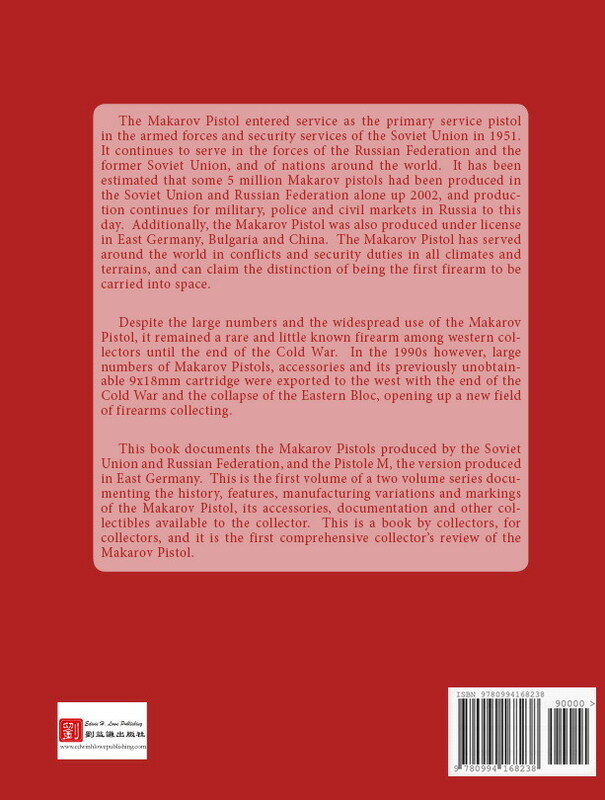 This is the first volume of a two volume series documenting the history, features, manufacturing variations and markings of the Makarov Pistol, its accessories, documentation and other collectibles available to the collector. 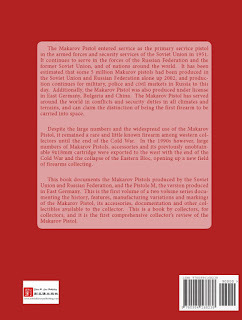 This is a book by collectors, for collectors, and it is the first comprehensive collector’s review of the Makarov Pistol. "Clear photos and lots of them, along with extensive references and a well researched bibliography, back up the conclusions the authors reached concerning dated variations of the pistols, holsters and ammunition. 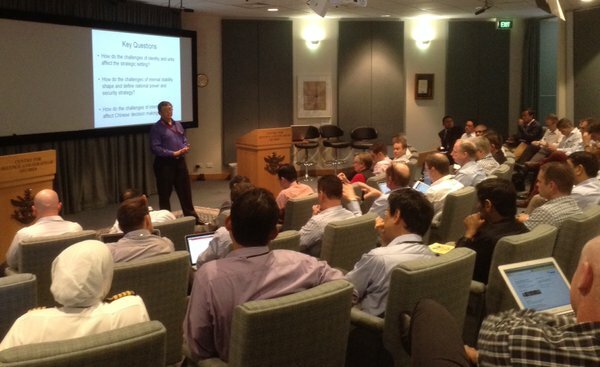 So many of the questions we receive on the Makarov forum will be addressed by the book's findings." "..the book is great. Clear Pictures a plenty. Paper quality is super. Information that is straight forward and when questions remain, they say so. Concise, clear and very handy to use. This is now the standard reference for the russian and east german." "This is a 1st Class book." "I would just add this: new book is THE BEST Makarov monograph available to date in any language. As a native russian speaker I have access to literature published overseas on this very interesting weapon and i can fully attest - there is no reference covering as many topics with detailed information backed by solid sources as this book, not even in Russia where pistol was originally designed and manufactured. Book covers history, design features, variations, collectability aspects, ammunition, accessories and many other topics for Russian and East German Makarovs in great details. It has many excellent color photos beautifully supporting text narrative. 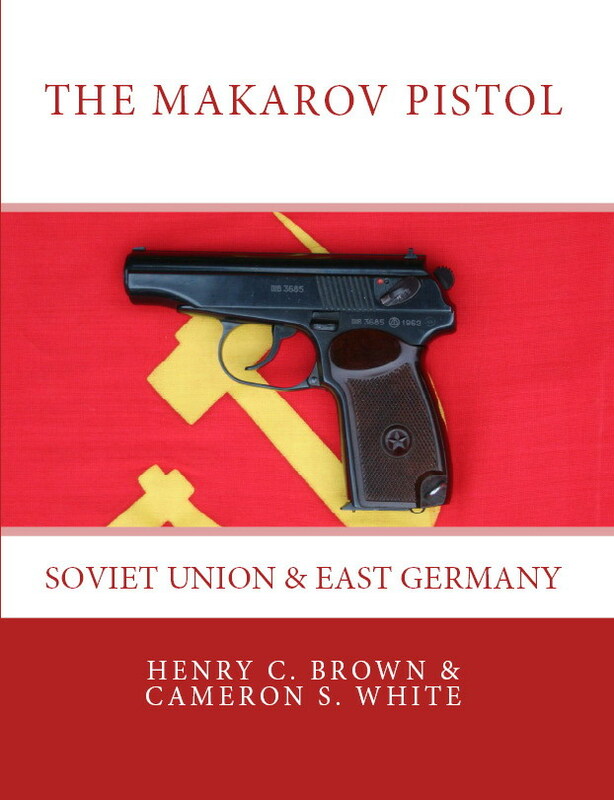 These pistols are not widely popular among collectors and I hope the book will help to close information gaps for western collectors and ultimately many more people will appreciate Makarov's simplistic elegance. Being avid collector I often spent hundreds of dollars for a good firearm reference books. Usually they printed in low volume and very quickly become collectible objects by itself. This book is very reasonably priced and is available for order from virtually anywhere in the world. I urge everybody interested in Communist block weapons to order a copy of the book for their collection." For over forty years, Barry Spurr has created a significant body of work in English literary scholarship, spanning a wide range of fields from Early Modern literature to contemporary Australian poetry. Barry Spurr is acknowledged as a leading scholar in the fields of religious literature and liturgical language, most notably in the works of Renaissance poet John Donne, the Modernist poet T.S. 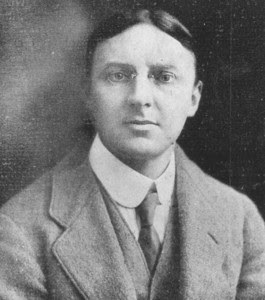 Eliot, and the language and literature of the Anglo-Catholic tradition. He was appointed by the University of Sydney as Australia's first Professor of Poetry and Poetics, and holds a notable reputation as a teacher and mentor to students, and as a friend to peers and colleagues. He has also been notable as a public intellectual, with a particular interest in the role of literature in the modern education system, and the role of the humanities in the modern university. 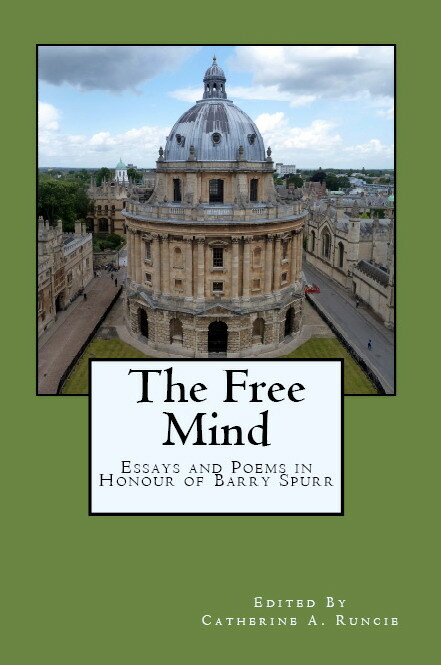 This book is a collection of scholarly papers, contemplative essays and poems, written or contributed in honour of Barry Spurr. 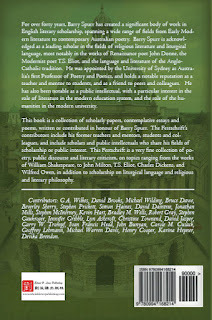 The Festschrift's contributors include his former teachers and mentors, his students and colleagues, and includes scholars and public intellectuals in his fields of scholarship or public interest. 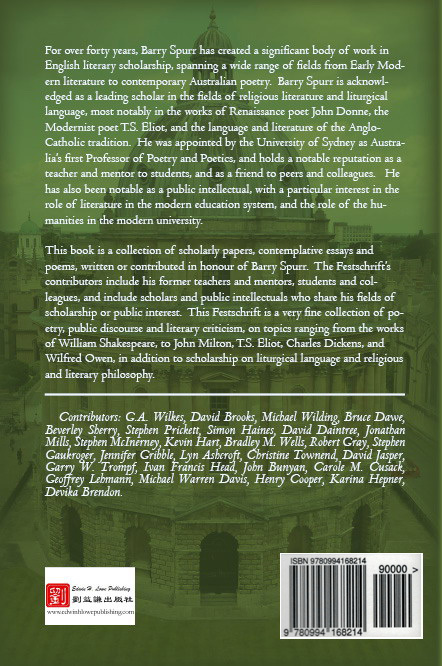 This Festschrift is a very fine collection of poetry, public discourse and literary criticism, on topics ranging from the works of William Shakespeare, to John Milton, T.S. Eliot, Charles Dickens, and Wilfred Owen, in addition to scholarship on liturgical language and religious and literary philosophy. Stephen Prickett - Why Study the Humanities? Kevin Hart - Eliot's Rose-Garden: Some Phenomenology and Theology in "Burnt Norton"
Nice to receive a recent and kind review by J. Wilson at the 'Martial Thoughts' blog (read it here) (I got 5 out of 5 'Ninja stars'!) of The Chinese Martial Code: The Art of War of Sun Tzu, The Precepts of War by Sima Rangju, Wu Zi on the Art of War by A.L. Sadler & Edwin Lowe, published by Tuttle in 2009! 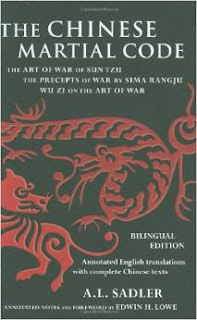 The review covers my introductory chapters about classical Chinese strategic thought, the relevance of pre-modern Chinese strategic thought in the age of post-modern war, the classical strategists Sun Zi, Wu Qi and Sima Rangju and their translator, the Japanologist, Arthur L. Sadler, who did his work during the Pacific War in 1944. Arthur Sadler is a favourite figure of mine, both intellectually and professionally. Professor of Oriental Studies at the University of Sydney (1922-1948) and concurrent Professor of Japanese (1931-1937) at the Royal Military College, Duntroon (Victoria Barracks, Sydney), Sadler was born in Hackney, London and read Hebrew and Assyrian at St John's College, Oxford and later specialised in Japanese. A scholar in the classic British mould, he lived and breathed his scholarship, which crossed over into his everyday life. He built a house, 'Rivenhall' (which I have had the pleasure to have visited - its owner is Sadler's former student) in Warrawee, Sydney, carving it out of the bush in the 1920s. Building it in a unique trans-cultural style, Sadler blended Neo-Georgian and Tudor, and filled it with self styled Jacobean furniture (made in Japan), and personally landscaped it with Italianate water features and Japanese garden, complete with tea house where he and his wife entertained students, and an ornamental gate, disguising the vulgarity of the concrete septic tank. He was a leading figure in the Australian Japanalia scene, pioneering and popularising the collection of Japanese colour woodblock prints. Sadler cut a figure amidst the golden sandstone at the University of Sydney, a dapper, donnish Englishman clad in tweed with a pince-nez - he was built like a rugby player and practised kendo, keeping a suit of samurai armour in his office. He attended professorial meetings with reluctance and chose to read through the meetings instead, to show his contempt for administration. In his teaching, he considered teaching assistants a nuisance and taught most of the curriculum himself. In his Japanese language classes, he despised teaching grammar and chose to teach selected readings in depth instead, in order to best learn the language and culture (I love this guy!!). He taught oriental history and his courses were popular amongst specialist and non-specialist students alike, who delighted in his lively and anecdote filled lectures (today, we call this 'engaging'), which students recalled in the years and decades afterwards. His students were the generation of Japanologist and Orientalists who went off to fight Japan in WWII. His students served in various intelligence roles, and remembered well Sadler's teaching of his deep understanding of Japanese culture, and what to expect in war with the Japanese. Armed with the knowledge of Japanese militarism and bushido, few of his students were suprised by their experiences in the South West Pacific and South East Asia. Denied a military intelligence role during WWII, seemingly due to his Japanese born wife (a British subject and the daughter of a Royal Navy officer), he continued his already pioneering and prolific writing throughout the war. Sadler was a pioneer in what we today call 'strategic culture' and 'conflict ethnography' - understanding the enemy at a fundamental level. He spent the war translating Japanese and Chinese texts in order to better 'know the enemy', including the probably the first translations of the classical Chinese strategists Wu Qi and Sima Rangju. He was consultant to the Australian government, regarding the rituals and ceremonies of the military funerals and repatriation of the remains of the Japanese sailors who died in their attack on Sydney Harbour in 1942. Sadler retired in 1948 and returned to Britain, where he died in 1970. We can only wonder what Arthur Sadler would have made of the working conditions and demands in the modern Australian university, and how they go about the teaching of foreign languages, cultures and history. Perhaps he would have taken his kendo sword and sorted the lot of them out?